Special Containment Procedures: Task Force Tau-6 are assigned to monitor SCP-406 and process SCP-406-1 instances. They are to be based in a converted small industrial unit at a nearby industrial park, behind a Foundation front company ("Simon's Carpet Paradise"). The emergence point and western entrance of SCP-406 are to be monitored via closed circuit television cameras. Concealed lighting and infrared sensors are to be fitted to detect and illuminate emerging SCP-406-1 instances, and emergency clothing, non-perishable food, and basic first aid supplies are to be concealed behind false brickwork on the opposite wall. Two-way audio communication is to be enabled, via concealed microphones and speakers, between Tau-6 and the emergence point, to guide and instruct SCP-406-1 instances, and to wake them if necessary. The gate at the open western entrance is to be kept locked. Trespassers are to be monitored and are to be detained and administered amnestics if they witness an SCP-406-1 instance. SCP-406-1 instances are to be retrieved by members of Tau-6 and taken to Sector-25, debriefed, administered amnestics, then escorted to their point of origin. Fabricated cover stories and/or amnestics are to be used to explain the absence of SCP-406-1 instances. All SCP-406-1 instances are to be logged and remotely monitored for a period of 5 years (previously 20), and detained if any anomalous properties become apparent. A proposal for covert monitoring of residents of the origin area to prevent or reduce disappearance event frequency is currently under review. 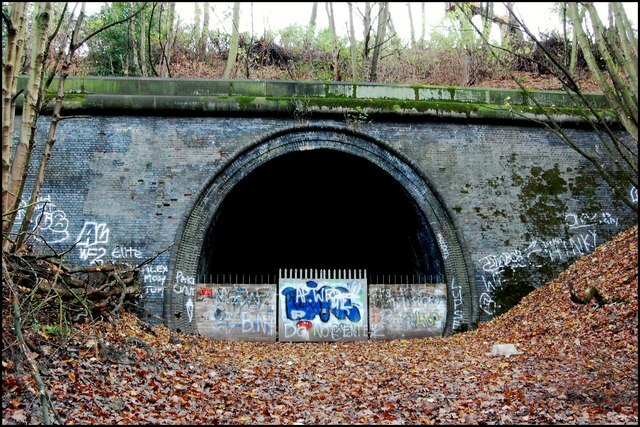 Description: SCP-406 is a 228-metre-long disused railway tunnel in Crigglestone, England. The eastern entrance has been infilled and is inaccessible. The western entrance is blocked by a metal fence with a locked gate. SCP-406-1 are persons who emerge via unknown means through the inner northern wall of SCP-406, at a point 15.3 metres from the closed end of the tunnel. SCP-406-1 instances are invariably initially asleep and walking upright, but most instances wake up naturally shortly after their appearance, usually due to the sudden shock of the cold air within the tunnel. Initial inspection and testing of the emergence point was unable to identify any anomalous effects. Further testing of the emergence point is prohibited until further notice. See document SCP-406-A. SCP-406's first known anomalous event on record was in December 1981, when the naked body of Mr █████ ████████, 24, was found within the tunnel, having died of head injuries and exposure after apparently tripping and falling within the tunnel. A tattoo was identified and later matched against a missing persons report in Illinois, USA. A subsequent instance of SCP-406-1 was recovered alive in February 1982, Miss ███████ █████, 8, and the anomalous nature of the tunnel became apparent. The Foundation became aware of SCP-406 at this point and established initial containment procedures. All instances of SCP-406-1 to date have originated in the rough geographical area of Douglas County, Illinois and a small portion of the southern end of Champaign County, Illinois, and appeared within SCP-406 shortly after falling asleep. Instances of SCP-406-1 do not report abnormal histories of sleepwalking. To date, no attempt to witness or record the disappearance of an SCP-406-1 instance from their origin point has been successful. Current conjecture suggests that a disappearance will not occur unless unobserved. No SCP-406-1 has yet to report any memories of their time between falling asleep and waking within SCP-406, and no attempt to recover memories has yet been successful. To date, ███ instances of SCP-406-1 have been recovered. SCP-406-1 instances are not known to be anomalous. No individual SCP-406-1 instance has appeared more than once. On August 14th 1989, at 17:32 GMT, an emergence event occurred during exploratory drilling of the materials of the wall at the emergence point. Despite immediate medical intervention, Mrs ████ ████████, 76, died at the scene. Mrs ████████ was not known to have had any living relatives, and staff at the nursing home where she resided were administered amnestics and a cover story (heart failure). Technician █████, manning the drill at the time, also requested amnestics. This was denied. A leave of absence was granted.